Broomball is an ice-based game that is closely related to ice hockey and was founded in Canada. Its exact history is a bit unclear, but it is thought it was invented in the Ontario region of Canada, where there are documented games going back to the late 1800s. Broomball is a team game with two opposing sides of six players played on an ice hockey rink. Unlike ice hockey, in which players wear ice hockey boots, in Broomball, players wear special rubber soled shoes and use a stick called a ‘broom’ with a triangular head to hit a small ball on the ice. Aiming to win the game by scoring more points than their opponents, Broomball, like its close relative, ice hockey, is a very physical game. Today it is played in a number of other countries and is particularly popular in Scandinavian countries, such as Sweden. It is the Canadian province of Manitoba though that is the hotbed of Broomball and where it is played most. The game is overseen by the International Federation of Broomball Associations (IFBA). The object of Broomball is for one team to win the game by scoring more goals than their opposition. Teams do this by moving the ball up-field as a team until they are in a position to shoot for goal. Teams, whilst attacking the opposition goal must also be prepared to defend their goal quickly if they lose possession of the ball. Like ice hockey, Broomball is an extremely physical game that can get extremely rough at times. The protective pieces of equipment are vital due to the extreme physical nature of the sport in which injuries are common. A regulation broom is also required by each player and an official broomball ball should also be used in all games of broomball that are played. Scoring is simple in Broomball, a goal (one point) being scored every time a team manages to hit the ball past the opposition's goalkeeper and across the net’s goal line. It takes a great deal of teamwork to for a team to work the ball into a scoring opportunity and teams must always be aware of the possibility of a counterattack from the opposition. To win a game of Broomball, a team must work together to score more points than their opponent. At the end of the game, the team with the most amount of points is declared the winner. In a regular season game, tied games do not go to a shootout. In playoff games, five players from each team will each take a penalty shot at goal. The team with the most goals at the end of this is declared the winner. If there is still a tie, then further rounds are done on a sudden death format. A game of Broomball begins with the team defending the zone furthest from their bench during the first period of play, changing ends at the end of each period. Once the game begins after a faceoff between a player from each team, each team will simultaneously attempt to score a goal in the opposition’s net whilst at the same time preventing the opposition from scoring in theirs. A face off shall occur the restart the game after each goal. Players can pass the ball between themselves using the stick. Goals can only be scored if the ball has been hit by the stick. A goal will not be awarded if the ball has rebounded off another player. Brooms may never be swung above waist height. 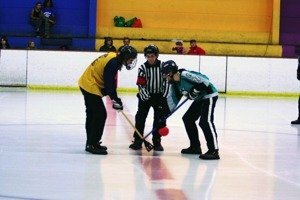 Broomball games are controlled by two referees who are on the ice during the game and have the same powers to award goals, call penalties and fouls etc. In higher-level games, there are often other officials off the rink too, such as goal judges and a timekeeper. Players are allowed to use the stick to try and take the ball off opposition players. At the end of the game, the team who has scored the most goals is declared the winner.